With the time machine damaged, Paul needs an expert in electrical engineering and theoretical physics… who in this universe is Gary Canning! Gary is reluctant to help because his mum has made him promise. Paul tells him to name his price but Gary says success isn't just about money, as he looks wistfully towards Dipi at the counter. Paul goes to try and get Dipi's number for Gary but she's not impressed. Paul lies to Gary that Dipi wants him to call her tonight. …And this old fan's heart is racing as they have pulled off the biggest surprise yet. In this reality Julie Martin didn't die 23 years ago but is alive and well and living in London. She answers a call on her phone from Philip. PHILIP: You could say that. PHILIP: You don't have to sound so gleeful about it! JULIE: I hate to say it but what goes around comes around. PHILIP: Julie, you love to say it! JULIE: I'm not going to apologise. I warned you about that woman. PHILIP: Yeah, I know, I know. JULIE: Pity you never listen. Julie is working for Lassiters. She asks Philip what his plans are. Surely he's not going to sit around feeling sorry for himself? JULIE: I've got to go, but I do just want to say… I am sorry, Philip. PHILIP: Well I appreciate the chat. JULIE: It's a pity you're not in London; might have been nice to catch up properly. PHILIP: What's keeping me here? JULIE: You're busy aren't you? With your new book. PHILIP: Do you follow my Twitter? JULIE: I'm not sure; it just came up. PHILIP: Well, I could write it from anywhere. 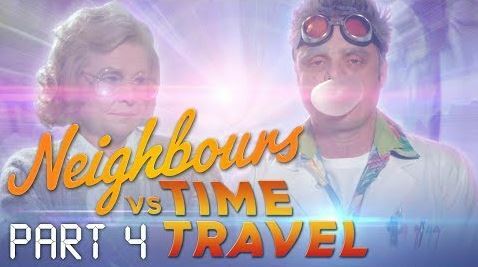 Gary gets the time machine working with some chewing gum when Sheila appears, horrified that Gary is meddling with the space- time continuum again. SHEILA: You could cause a paradigm! SHEILA: Whatever it is; it's unorthodox. PAUL: Get off your soap box. SHEILA: Oh, I remember what happened to Ashton Kutcher in that silly Butterfly film. And for all I know, I may not even exist in the alpha timeline. Paul tells them they are both better off in the other timeline. Sheila tries to take a hammer to the device but Gary stops her; he's putting a stop to her meddling in his life. It's dark and Paul is getting into Hermione. Gary tells him he has to hit 141.622 km/h to activate the device. Paul speeds off and watches the speed going up when there's a siren and flashing red and blue lights. He's been pulled over by… Stingray! PAUL: Stingray? I thought you were a nurse! STINGRAY: Shhh… I'm under cover! Paul bribes Stingray and he's on his way again. Goth Tyler with long black hair, a nose ring and black lipstick is recording a video outside Grease Monkeys (which has a big neon "Vegan" sign). He has had one of the worst days of his life, having to walk to the train station in the sun, and his ex- girlfriend Bree telling all his friends that he cried during Survivor. Piper comes out of Grease Monkeys and accuses him of scaring off the customers but asks him if he has a light. TYLER: All I have is darkness. Paul is speeding along in the car. Rob tells Tyler and Piper to watch out but it's too late as Paul hits Piper.